Webster defines art as “something that is created with imagination and skill and that is beautiful and that expresses important ideas or feelings”. An artist then is one whose “skill is acquired by experience, study, and observation”. “This is our ideal: To devote our lives with love and enthusiasm to the advancement of a great art – the art of taxidermy… and we pledge to you, the Sportsman, that your work, if entrusted to us will receive the same high character of treatment that is evidenced throughout these pages.” Wow. 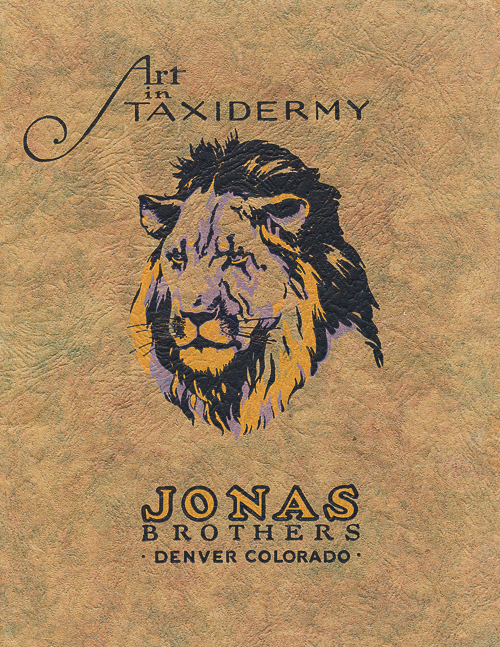 The Jonas ideal was to create the finest possible, quality taxidermy, with every mount. Because they knew that otherwise, their customers would merely receive the standard process of an assembly line. They wanted the art of their craft to shine through. There were no shows in those days to compare their day to day work, instead, every job simply received the effort of a “competition” piece. There was no such thought as “just commercial work” for every mount was a show-piece to them! Why? Because they knew that their clients were the ones who really counted. They knew that their clients were the ones who payed their bills and kept them in business. Their clients were the the ones to whom they were responsible. And they pledged artistic quality to all who entered their doors. My personal goal has always been to put this “sensitivity of a sculptor” into all my forms so that some of this “artistic quality” would be built into the manikin. When you look at an old paper form from that early Jonas era, you really begin to understand. There was very little detail or symmetry (caused by the paper form process), no pre-set eyes…in fact, there was no pre-set anything. The form was merely a base on which the skilled taxidermist performed his art! And that is how it should be, even today. While foam completely changed the possibilities for detail in a modern mannikin, and while it certainly is possible to simply glue a skin directly to a modern form without any changes, the best taxidermy, artistic taxidermy, still demands life-long study and continuous improvement in skill. And, it still demands… an Ideal and a Pledge. Great Start to your blog!!! . I have that same Jonas Brochure In my desk drawer from 1938. Along with many others. I have mounted on many Jonas paper forms in the 60’s and 70’s and the knowledge you needed back then to create great work was surmountable and much of it will be lost and we, as real taxidermy artists, will be extinct as my and your generation of taxidermist pass on. I’ve spent many a night in my teens laying up glue and tearing paper to put up my own paper forms in my own plaster molds. Waxing them and buffing them before starting. to those in the business ,mount an piece on one of those rosin paper forms and you’ll earn much more of my respect. Our generation of taxidermists, anyone over the age of 50+ that started as early as kids back in the 60’s and 70’s we knew a lot and it’s soon to go the way of the dinosaurs. We had the ability to create artistic pieces of taxidermy from the supplies that we could get from the local hardware store and make our own molds and forms cast jaws or make them real teeth and sculpt realistic mouth tissue with out own hands and beeswax or putty. You Denny have brought taxidermy to the higher standards that we have today.But many years form now all that my generation of artists could do and can do will be a forgotten art as techniques in casting and molding and snap together taxidermy parts make it possible for anyone with little or no artistic ability create taxidermy. True but I bet there still will be those that just dont have the ability to make them look as good as some others do. It amazes me how many poor looking mounts are still being put out with the great forms available. Im sure you all see some catalogs out there that have forms that are many years old along with some nice up to date forms. Why is this? Just my 2 cents worth. This goes exactly yo my point as an artist. You can make anything and give it someone that has not artistic ability at all and that does not make them a taxidermist. The way taxidermy supply companies market for for sales to the public and give the impression that anyone can do quality work. They can’t without any type of foundation. I can still if I had to produce quality piece ANY form even paper still. It’s not about the forms , it’s about COMMITMENT to the ART ! Well I might as well as my 2 cents into the changes in the industry over the years. I started at age 13 with the Northwestern School of Taxidermy books a friend of mine had in his closet. That was 47 years ago and I have been a benefactor of the changes in manikins from the old red rosin paper deer forms to the sculpted foam forms of today. Amazing. I applaud all that have participated to make the industry an art form only a few are blessed to conquer. Keep the dreams alive. You are not just preserving a magnificent animal/bird/fish but preserving a memory. Priceless!! !